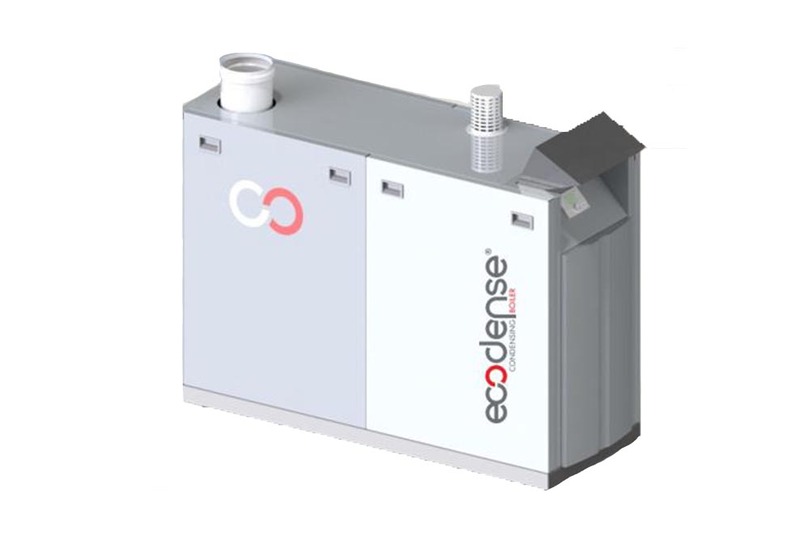 How Do a Floor Standing Commercial Gas Condensing Boilers Work ? In the exhaust gases from a gas fired commercial boiler, water vapour is always present due to the hydrogen bound in the fuel. This water vapour begins to condense at a certain temperature (similar to the humidity that precipitates on a cold windowpane). This condensing temperature is approximately 55 ° C for gas fired boilers. Condensation releases the “heat or energy” of condensation that can be used to heat any commercial or industrial building. The proportion of heat of condensation in the total fuel energy is about 11% for gas. In conventional gas fired commercial boilers, the flue gases must not condense during normal operation. 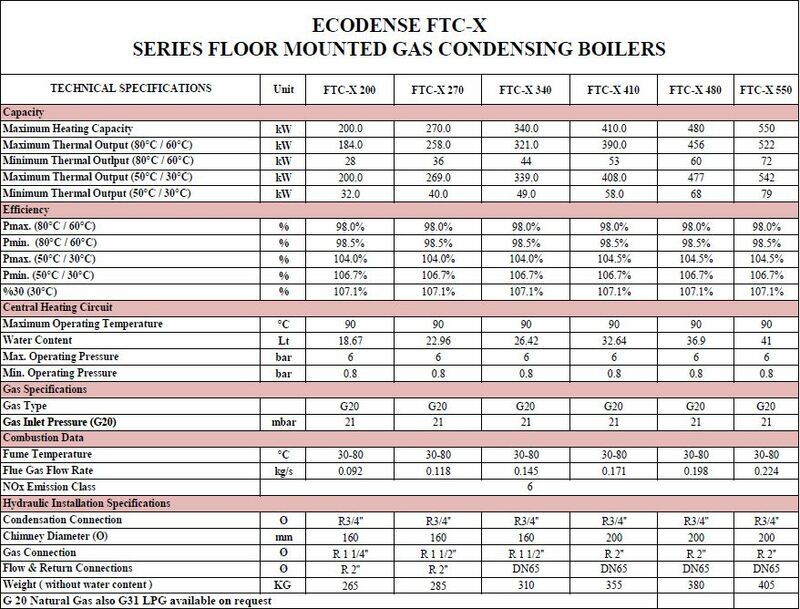 Therefore, the exhaust gases leave a low temperature boiler non condensing commercial gas boiler at 150 ° -200 ° C. For condensing boilers, on the other hand, the heat exchanger is designed to be suitable for condensation operation. Thus, the heat gains by condensation and by the further cooling of the exhaust gases (to about 5-20 ° C above the return temperature) can be used, and thus save on energy / fuel consumption. delivered to the pre-mix burner. 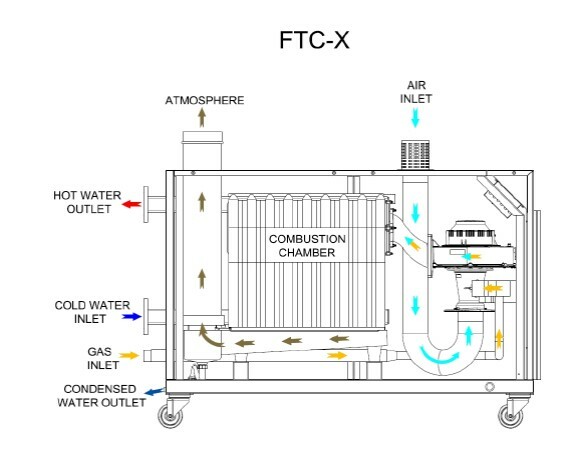 The products of combustion, in the form of hot flue gases, are forced through the heat exchanger transferring their heat to the system water (the flue gas temperature is reduced to approximately 5-20°C above the temperature of the system return water) then discharged via the condensate collector, to the flue gas outlet connection ,and then into the atmosphere. Should you require anymore assistance or information on our Floor Standing Commercial Gas Condensing Boilers / Floor Standing Commercial LPG Condensing Boilers / Floor Standing Commercial Cascade Condensing Boilers , please don’t hesitate to contact our sales team on 01202 822221 or click here for our email contact form.